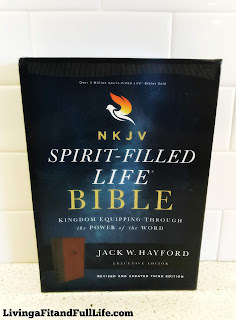 Living a Fit and Full Life: Dive into the Bible with the New NKJV, Spirit-Filled Life Bible from Thomas Nelson! Dive into the Bible with the New NKJV, Spirit-Filled Life Bible from Thomas Nelson! Dive into the Bible with the new NKJV, Spirit-Filled Life Bible from Thomas Nelson! The new NKJV, Spirit-Filled Life Bible from Thomas Nelson is as beautiful inside as it is outside. It's an amazing source for solid biblical truth to help you grow closer in your walk with God. One of my favorite things about this Bible is the verse-by-verse study notes that explain each passage so you can understand the Bible like never before. I also love the 192 guided prayers based on significant passages throughout Scripture to help you pray your way through the Bible. This Bible is phenomenal and is available in Genuine Leather or Leathersoft. 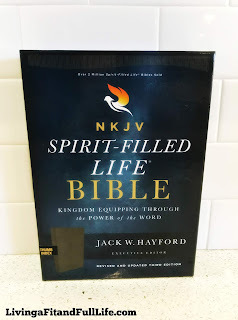 You can find NKJV, Spirit-Filled Life Bible, Third Edition, Genuine Leather on Amazon, Barnes and Noble and other bookstores.